Once in a while on a trip documenting avian natural history you get lucky and come across something that is known to happen but you may not have seen before. 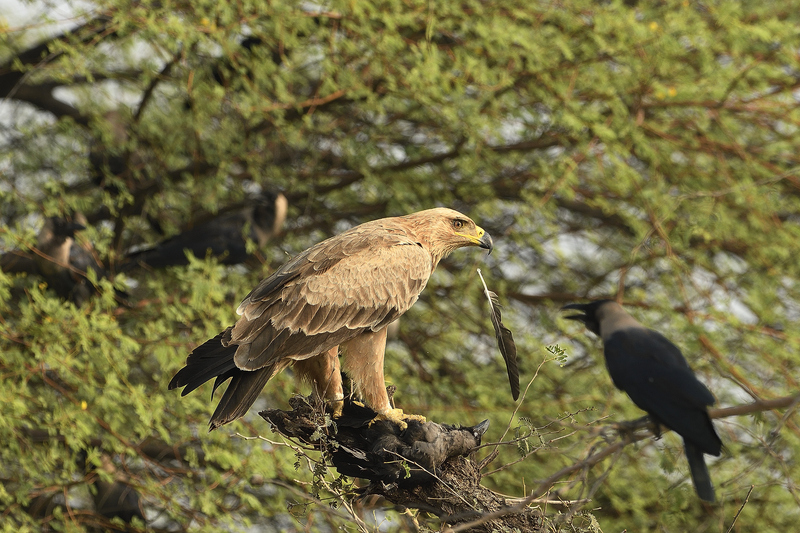 And I was lucky to witness something like this a couple of weeks back on a trip to Tal Chapar. We had all just arrived at the Forest Rest House at Tal Chapar, had a quick cup of morning chai and had set off around 7am into the Ghoshala area just outside the blackbuck sanctuary. This area is home to the Hardwicke’s Spiny-tailed Lizard and they are one of the reasons for a lot of raptors to visit Tal Chapar in the winter migratory season. These lizards live in burrows in the ground and come out as the sun heats up the ground to bask in the heat and feed on the grass near their burrows. 7am is a bit too early for them to emerge, though, and our idea was to scout out the area for any raptors that were waiting for them to make their appearance. As we were driving around, we came across a big flock of crows, probably about 40 in number. For those who don’t know this, a flock of crows is also referred to as a “murder”. The Oxford English Dictionary suggests this is an allusion to “the crow’s traditional association with violent death” or “its harsh and raucous cry.” If you’ve ever heard dozens of agitated crows in full cry, it really does sound as if they’re yelling bloody murder. All of these crows were sitting on the ground when we saw them. 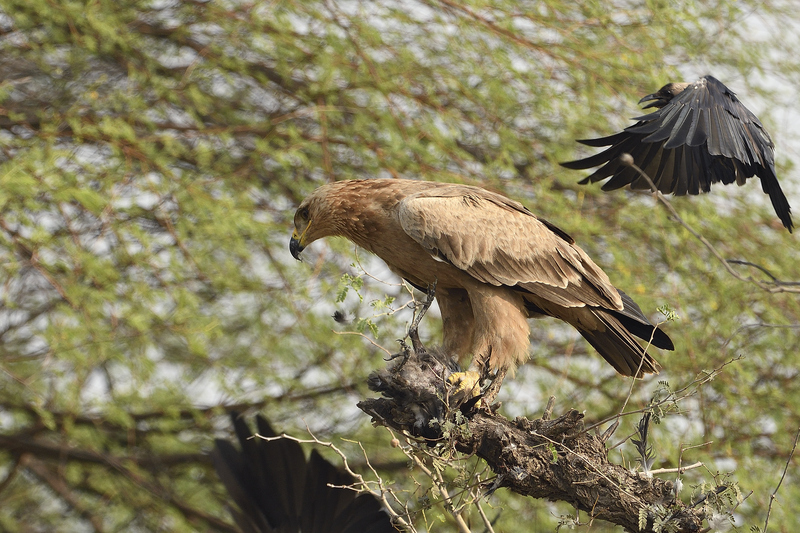 And right in the middle of this we saw a Tawny Eagle. We were wondering what was happening, but since our view was obstructed by a bush and we could not really see. A few seconds later the Tawny took flight and we could see that he had a dead crow in his talons. The eagle was immediately followed by the entire murder of crows caw-ing vociferously. It was a sight to behold and being completely unprepared for this none of us managed to capture this moment in our cameras. But sometimes that’s ok, I guess. 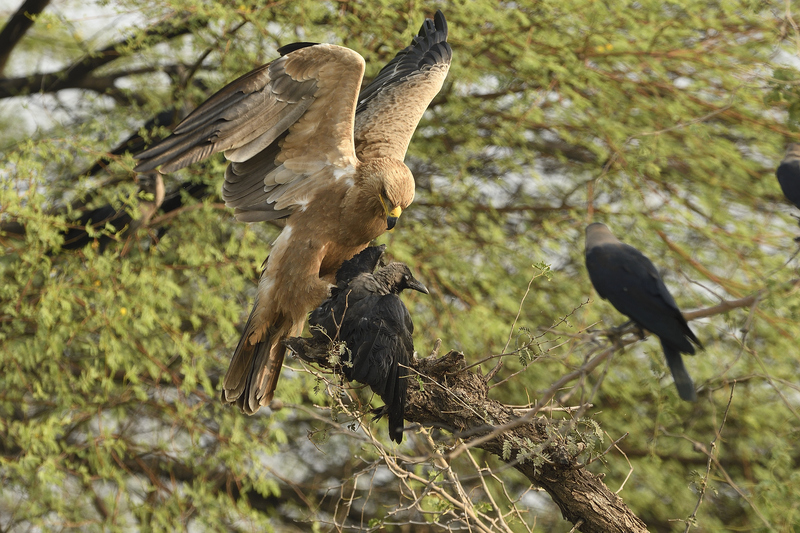 The scene is still vividly imprinted in my mind – just the thought of a large bird like a crow becoming a prey in front of our eyes was quite an unforgettable event. 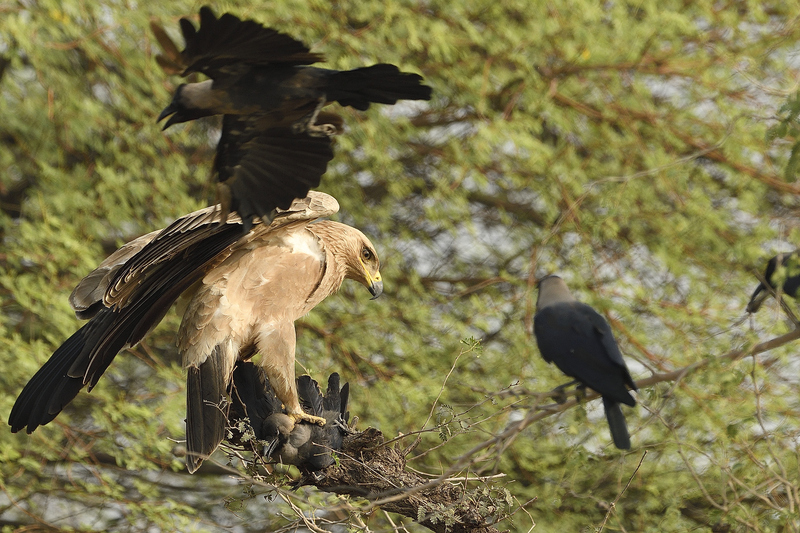 And the cacophony of the murder of flows flying behind, caw-ing and chasing the eagle just added to the drama of the occasion. 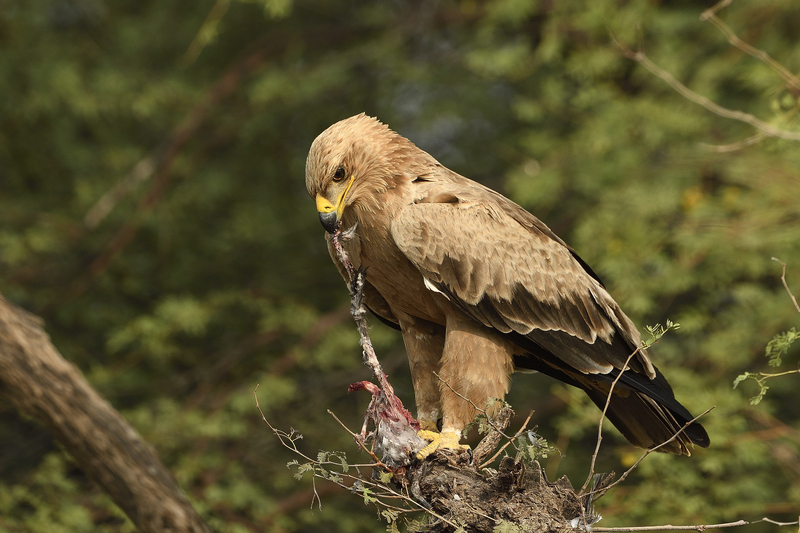 Thankfully, the Tawny Eagle didn’t fly too far from that spot. 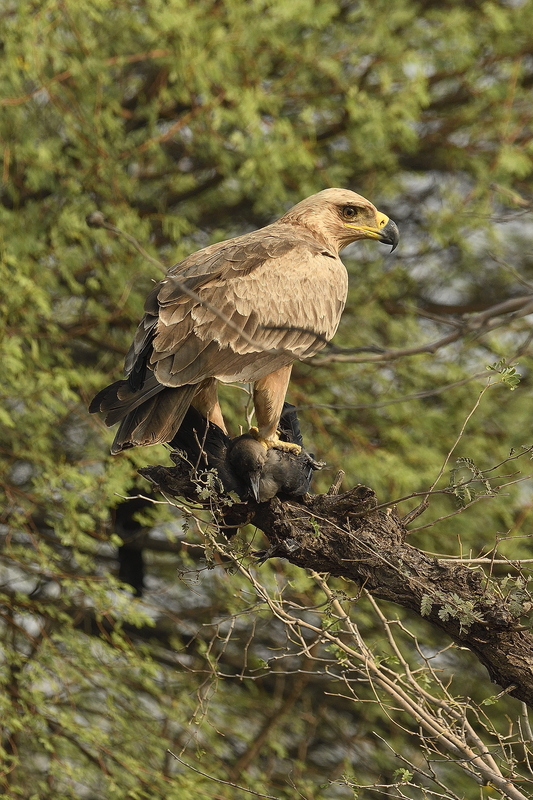 It must have done about 30-40 meters and found a nice perch on a dead tree and settled down with its potential meal. One of the first shots of the Tawny on the perch. The dead crow can be clearly seen under his talons. By this time, we had positioned our vehicle at the best possible spot to observe the entire scene and were soaking everything in. The silence in the vehicle would be punctuated by periods of rapid-fire machine-gun like clicks of the Nikon D500 and the Canon 1Dx. And as we would see something that caught anyone’s attention, that would be whispered for the others to latch on to. 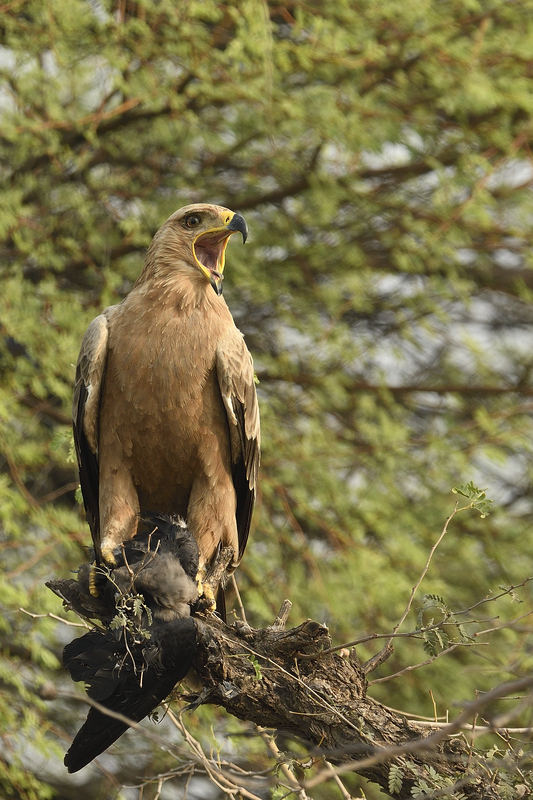 The Tawny Eagle was completely unperturbed by the chaos around him. He took his time to settle down on his perch, kept a close watch on what the other crows were doing around him and then got down to the job of stripping the feathers off the dead crow. Calmly and unhurriedly he went about this task for the next 15 or 20 minutes. 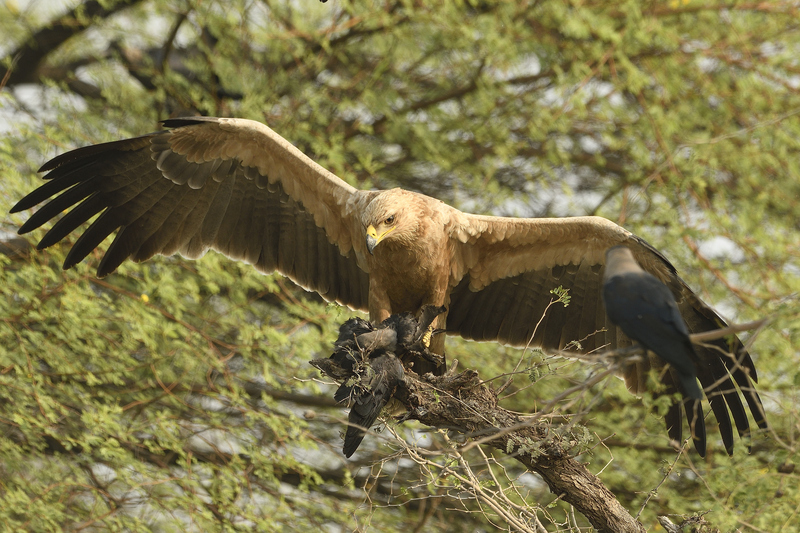 Some crows would fly into him from a nearby tree in an attempt to throw him off his task but he would not get fazed by such attempts. Slowly, the frequency of these attempts died down as the crows realised that they were up against a very determined enemy. A warning shout to the crows around, I reckon. As the first task of de-feathering his meal was coming to a close, he turned his attention to the head of the dead crow. He spent some time in decapitating the dead bird. And somewhere here I saw the raptor pluck the eyes of the crow out and swallow it. Wow, that was quite unbelievable. At this time we were all wondering aloud about how he would deal with the beak. And he answered that quite quickly and swiftly – the head was yanked out and was swallowed in one smooth motion. Again, not something that we expected, and there was a collective gasp inside the vehicle. He then turned his attention to the rest of his kill and completely stripped off the rest of the dead crow of its feathers. 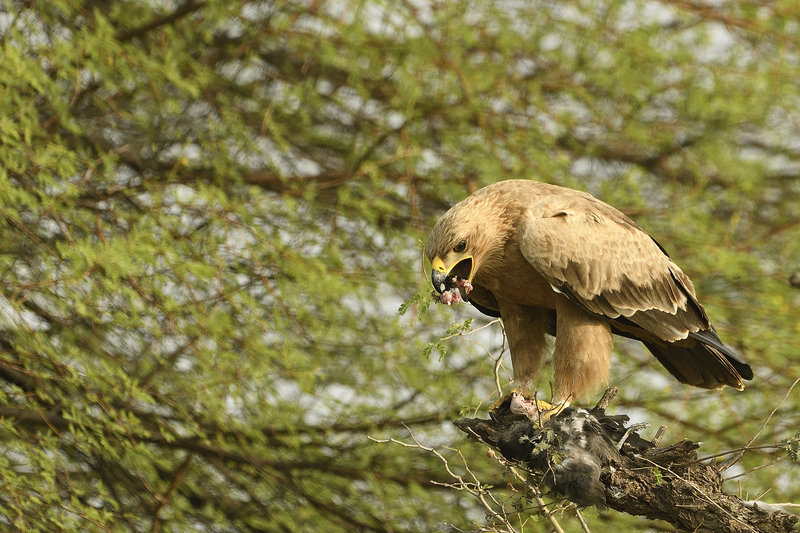 For such a big bird, we all agreed that the crow wouldn’t have made a filling meal for the massive Tawny Eagle. Start to finish this was a 51 minutes show of the brutal food chain that gets enacted every moment somewhere or the other. Seeing it happen right in front of our eyes was quiet a spectacle. Beautiful! I see a lot of red tail hawks around me and this makes me want to attempt some shots. Need a longer lens though.